How many of earth's moons crashed back into the planet? For decades, scientists have pondered how Earth acquired its only satellite, the Moon. 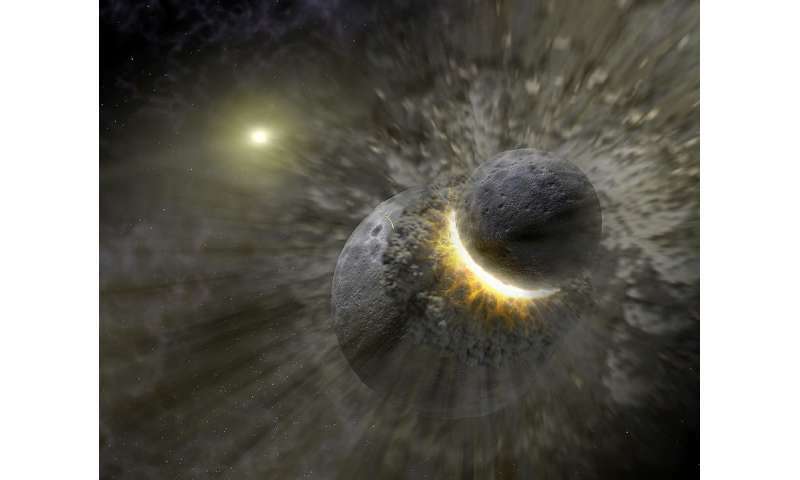 Whereas some have argued that it formed from material lost by Earth due to centrifugal force, or was captured by Earth's gravity, the most widely accepted theory is that the moon formed roughly 4.5 billion years ago when a Mars-sized object (named Theia) collided with a proto-Earth (aka. the Giant Impact Hypothesis). However, since the proto-Earth experienced many giant-impacts, several moons are expected to have formed in orbit around it over time. The question thus arises, what happened to these moons? Raising this very question, a team an international team of scientist conducted a study in which they suggest that these "moonlets" could have eventually crashed back into Earth, leaving only the one we see today. The study, titled "Moonfalls: Collisions between the Earth and its past moons", recently appeared online and is currently being reviewed for publication by the Monthly Notices of the Royal Astronomical Society. The study was led by Uri Malamud, a postdoctoral fellow from the Technion Israeli Institute of Technology, and included members from the University of Tübingen, Germany, and the University of Vienna. For the sake of their study, Dr. Malamud and his colleagues considered what would happen if Earth, in its earliest form, had experienced multiple giant impacts that predated the collision with Theia. Each of these impacts would have had the potential to form a sub-Lunar mass "moonlet" that would have interacted gravitationally with the proto-Earth, as well as any possible previously-formed moonlets. "In the current understanding of planet formation the late stages of terrestrial planet growth were through many giant collisions between planetary embryos. Such collisions form significant debris disks, which in turn can become moons. As we suggested and emphasized in this and our previous papers, given the rates of such collisions and the evolution of the moons – the existence of multiple moons and their mutual interactions will lead to moonfalls. It is an inherent, inescapable part of the current planet formation theory." "Our results however do show that in the case of a moonfall, the distribution of the material from the moonfall is not even on the Earth, and therefore such collisions can give rise to asymmetries and composition inhomogeneities. As we discuss in the paper, there are actually possible evidence for the latter – moonfalls can potentially explain the isotopic heterogeneities in highly siderophile elements in terrestrial rocks. In principle a moon collisions may also produce a large scale structure on the Earth, and we speculated that such an effect could have contributed to the formation of Earth's earliest super-continent. This aspect, however, is more speculative, and it is difficult to directly confirm, given the geological evolution of the Earth since those early times." Since that time, the moon is believed to have evolved due to mutual Earth and moon tides, migrating outwards to its current location, where it has been ever since. However, this paradigm does not consider impacts that took place before the arrival of Theia and the formation of Earth's only satellite. 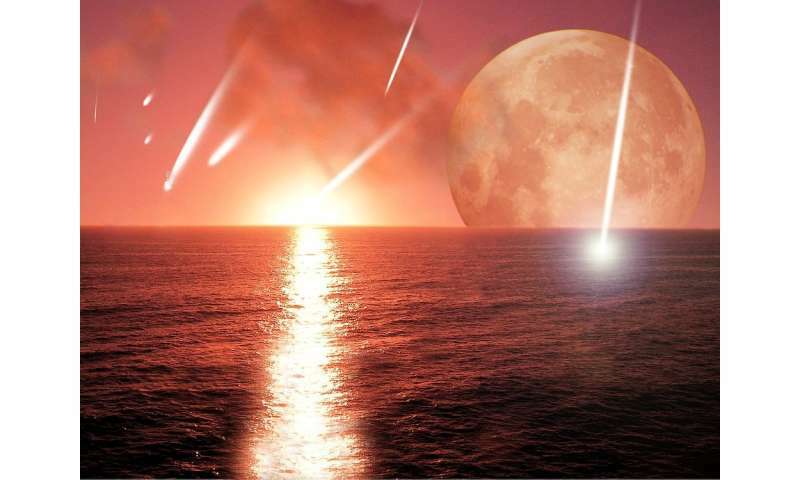 As a result, Dr. Malamud and his colleagues assert that it is disconnected from the wider picture of terrestrial planet formation. "On other planets we do see evidence for very large impacts that produced a planet scale topographic features, such as the so-called Mars dichotomy and possibly the dichotomy of Charon's surface," he said. "These had to arise from large scale impacts, but small enough as to make sub-global planet features. Moonfalls are natural progenitors of such impacts, but one cannot exclude some other large impacts by asteroids which could produce similar effects." There's also the possibility of such collisions happening in the distant future. According to current estimates of its migration, Mars' moon Phobos will eventually crash into the surface of the planet. 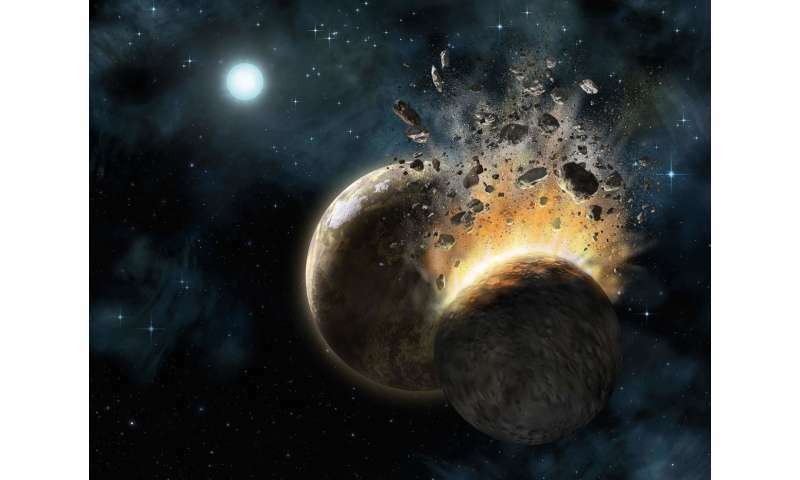 While small compared to the impacts that would have created moonlets and the moon around Earth, this eventual collision is direct evidence that moonfalls took place in the past and will again in the future.